What do you get for the boy who has everything? “Marilyn Monroe to Go” of course! It’s the answer to all of your birthday party or special events needs. Bambi La Fleur as Marilyn Monroe is very well respected, and recognized throughout the United States and Europe. She has been a delightful fixture at the famous Eden Roc Hotel. You’ll never know where she will do her next show. She’s Marilyn Monroe to Go! Now offering the young and spectacular, singing Elvis! Special pricing for Marilyn and Elvis Shows! Both great singers and impersonators. Entertainment you can trust! No photo retouching of images. What you see, is what you get. We guarantee it! The office and I hired Bambi to perform at our office for our boss' 60th Birthday! From the 1st second i talked to her over the phone i knew she was going to be fabulous! She arrived ahead of schedule and looked just like Marilyn Monroe!! It was truly unbelievable! She was in full character with the way she talked and carried herself. She truly is gorgeous! She sang two songs - one being Happy Bday Mr. President and to say she nailed it is an understatement. :) She has a gorgeous singing voice as well and if you hire her i promise you wont be disappointed! I only hope we have another reason to hire her again! Bambi was an amazing Marilyn Monroe look-alike ! Bambi arrived on time and in full Marilyn costume for my husbands birthday party. She even stayed longer in order to take pictures with her adoring fans. Thank you Bambi! You made our party a success! You are such a lovely woman and such a pleasure to work with! I love what I do, as you can tell. But what makes my job even better is being amongst such wonderful people! I enjoyed the party as much as the Birthday Boy! I left with a smile on my face that lasted all the way home. Hiring Bambi Marilyn Monroe was the highlight of our party ! She was amazing! She looks so much like Marilyn and her songs were wonderful! She interacted with the crowd. Everyone really enjoyed taking pictures with her. She was very graceful when she was walking around and taking pictures with everyone. Shr absolutely loves what she does and she did a wonderful job! So glad we hired her! She was a hit! Hired Bambi for my husband's 60th birthday celebration and couldn't be happier! She was absolutely professional, timely and soooo very sweet! She not only charmed the b-day boy, but all my guests as well. She genuinely channels Marilyn and remains in character while mingling! She's a classic Monroe beauty with a great singing voice who takes her time to make sure you're satisfied! ABSOLUTELY NO REGRETS HERE! Thank you Bambi! Bambi did a great job at my husband's 70th Birthday Party. She was professional from the first phone call. She greeted everyone at the party and did a super job singing to my husband. Thanks for making the party a success! Thank you Anne it was a really fun party, and you were a pleasure to work with! Bambi did a great job at a 90th birthday party for my uncle. From the time I called her to arrange the show until the time she performed she made it easy. She is a professional, takes pride in her work and entertained a crowd of 75 people. You won't be disappointed with hiring her. Thank you Steve! It was indeed my pleasure, and felt so fortunate to have been a part of such a wonderful family celebration, of this amazing man! I am truly grateful, and I love my job! We had the pleasure of having Bambi perform at my father-in-law's 80th birthday on Valentine's Day 2015. Not only is she absolutely stunning in person she is also a sweetheart! When she came into the room she commanded that room and she was not just a beautiful Marilyn Monroe impersonator BUT she WAS MARILYN - in her mannerisms, expressions and voice (both singing and speaking). Her timing was perfect (live performance in a room full of people she handled the crowd and birthday boy like a professional). She is sweet and approachable. We all loved her. Thank you Bambi for being the Piéce de rèsistance! I highly recommend her. Thank you so much Becky for letting me be a part of your celebration with your wonderful family and friends! It was such a pleasure working with Bambi during the planning process. She was accessible, responsive, articulate, and professional. Her performance at our event, an 80th birthday party celebration, was outstanding! Her impersonation of Marilyn was first-class and so convincing - it felt as though she was actually in the room! She handled our guests with such ease and so elegantly - she was absolutely lovely. Thank you so much Bambi and best wishes as you continue spreading joy with your amazing talents! Thank you Pam, it was such a pleasure to work with you, and get to know you best of all! It was a Birthday Party that I will never forget. I appreciate all your hard work on the event, and hope I have the privilege to work with you again! You are so much fun! Speaking to Bambi over the phone to set up this birthday surprise was just delightful. She is sweet as can be, organized, prompt in returning calls and coordinating with the activity director of the facility used. She really has an understanding of people and their needs. Her price was very fair. Bambi performed as Marilyn Monroe for our 96 year old Uncle's birthday breakfast at Forest Trace Retirement Home. She not only made my Uncle's day special, but everyone in the group breakfast room was in awe. The Activity director, Sandy, called me after the performance and was really WOWED? by Bambi's talent and sincerity. She stayed longer than our contract agreed upon with no extra charge. As promised, Bambi called me after to let me know how happy my uncle was and also to tell me what a great time that she had with these seniors. Bambi.... you are very special. May you have all the success you deserve. Amazing!!!!! A night to remember..
Bambi, you are truly a class act.... Everyone absolutely loved your performance and interaction with the guests. You were Amazing!!! You made my husband's 50th birthday, one that he will never forget... Thank you so much.. I hired Marilyn for our grand opening event and she was a hit! Everyone wanted to take their picture with her. She totally played the part from her voice, clothing and acting. I would recommend her again (and I did) and I would hire her again too! It was a fun group and a pleasure! Thanks for all your kind words. We were afraid to hire a Marilyn, because so many do not look like "the picture" Bambi as Marilyn was exactly as she appeared in her photo's. Even more beautiul! Thanks to her we had a great Birthday! Bambi as Marilyn was terrific. She is a class act! Bambi as Marilyn made the surprise party for my Husband very special for him and so very entertaining for the guests. We would not hesitate to have her at our next event. Bambi was a pleasure to work with. She was communicative, professional and punctual. She arrived in character and was a big hit as a surprise guest at our birthday party. 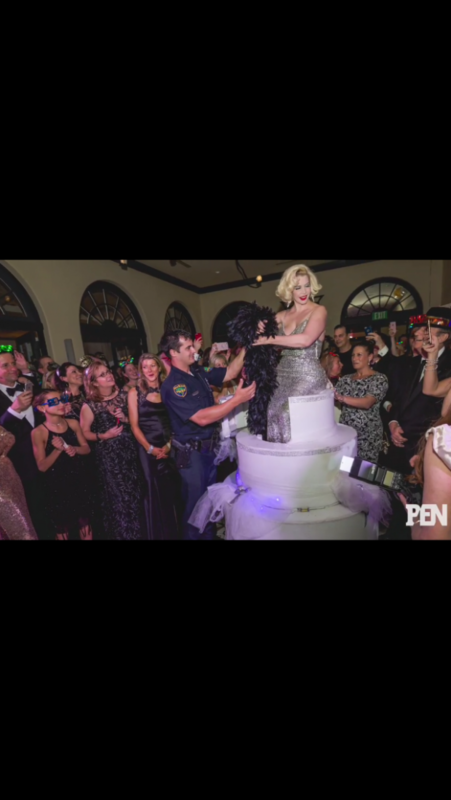 The photos with "Marilyn" and our guests are priceless. She really helped to enhance a wonderful evening! Everyone thought they were in the room with Marilyn. Not only did she look just like Marilyn but she spoke and sang like her too. She never broke character. As the coordinator of this any many other events around the world I have to say that Bambi is a real pro and has now made the fifth event I have used her for an amazing success that people are still talking about. As a professional in the business for 14 years, I highly recommend her services which are a great balance of talent and professionalism. It was wonderful. Everyone had a great time. All the guests, especially the "birthday boy" enjoyed themselves and the show.. She was helpful, and accommodating during the planning ... stayed in touch during the process, and great follow through. I would definitely use her services again. 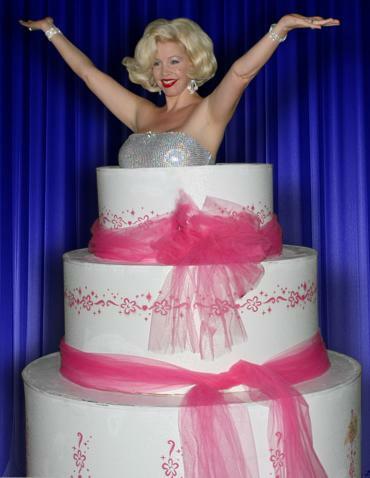 Marilyn Monroe To Go is also available for booking with her very own pop out party cake! The cake can be decorated to match your party's theme. Also available for rental.